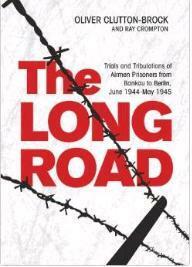 This Book has been co-authored by one of our Members, Ray Crompton who served on the Squadron from 56-57, Venom era. On behalf of the event organizers and The Royal Air Forces Association [RAFA] I would like to invite yourself and 249 Association members to join us at this unique event and, if you wish, take part in the RAFA Salute to the Few Parade and Sunset Ceremony which will take place at the end of the afternoon’s activities from approximately 4.00pm to 4.45pm. This charity fund raising family day out is staged by Weald Aviation and Epping Forest District Council, with the support of airfield users/tenants and the local community. Each year it attracts more than 4,000 people and has a different theme linked to the 99 year history of our still very active airfield. Aimed at saluting all those, service and civilian, who served with /supported the 50 Squadrons from 7 Nations that flew from RAF North Weald between 1916 and 1964; while celebrating The Spirit of North Weald which continues to thrive in our community in the 21st century. This year’s theme is the 75th Anniversary of the Battle of Britain, when young pilots and their comrades on the ground, both service and civilian, fought and died for our freedom while serving at airfields like RAF North Weald. Commemorating their vital role in the battle and featuring a parade and sunset ceremony, ‘A Salute to The Few’, staged by RAFA South and Eastern Area. 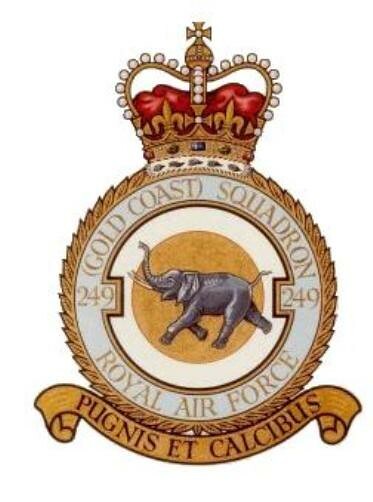 Although not an air show as such but a day out for all the family; helping to raise funds for the events two nominated charities, one of which is the Royal Air Forces Associations 2015 Wings Appeal. It will incorporate a number of flying displays, with a display by a Spitfire and Hurricane of the RAF Battle of Britain Flight booked, other RAF involvement requested, and a variety of visiting aircraft expected. Most of the airfields home based aircraft will also be on show, including; Mustang, Spitfire, Hurricane, Dakota, Seafire, Tempest, Jet Provost, Vampire, Hunter – to name a few. Alongside a ‘Battle of Britain’ Exhibition area, with WW2 re-enactment groups and military vehicles, various stalls, a varied range of refreshment outlets and the ever present Essex Air Ambulance. Entrance is once again only £5 per person, with all attractions in the children’s Adventure Area still free; gates will be open from 10am, with arena displays starting at 12.30. The spirit of the young men of 249 who flew from RAF North Weald during the Battle of Britain is today commemorated by the Hurricane Gate Guardian that welcomes all who enter our still very active airfield; and on the day will be represented by the standard of 249 Squadron ATC. So I look forward to hearing that you are able to be with us on Sunday the 12th July, in the meantime if you need any further information I can be contacted on 01992524440 or at arthurmoreton@btinternet.com . Chairman. 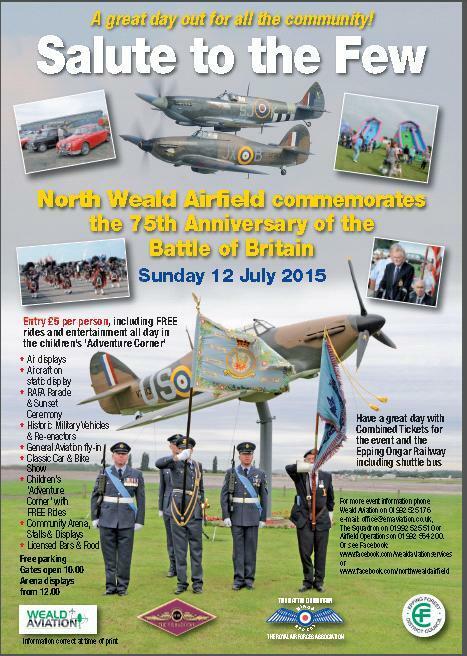 North Weald & Ongar Royal Air Forces Association.